This is a movie I thought I'd never review as there's been countless debates and discussions about the various themes shown here and theories on what it all means. After watching it last night I thought I'd avoid all that and just review it as a straight up movie without delving into it's apparently deep mythology. Weirdly enough just like the recent film adaption of Stephen King's IT, there's also a separate mini series and just like the IT mini series, it's not worth watching. Even less so in fact which is saying something. 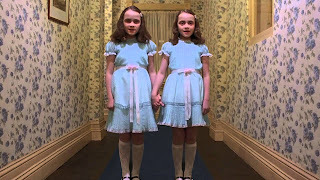 This film version is directed by the legendary Stanley Kubrick and is famously disliked by Stephen King who wrote the original novel mostly just because it very different from the source material. Normally that would ring the death knell for most adaptions, but Kubrick's version, in my opinion, improves on the source material vastly. The story follows Jack Torrance (Jack Nicholson) as he is hired to be the caretaker of the massive Overlook Hotel located in the the Colorado Rockies. Jack's an aspiring writer and looks to complete his first novel as he's also bringing his family in the form of his wife Wendy (Shelley Duvall) and young son Danny (Danny Lloyd). 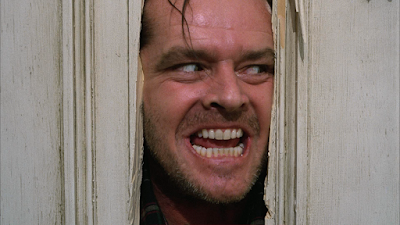 Quickly we find out that Danny is no ordinary boy as he has a special gift known as The Shining, which shows him visions of the past and future while he sleeps, and also shows him what may be hallucinations (or terrifying real events) as he explores the hotel. The isolation of the hotel starts to get to each one of them slowly, building to total insanity in more ways than one. First of all I think I need to talk about the fear factor here as for a long time, this has been known as one of the scariest (if not scariest) movies ever made. And in my opinion, I have to agree. While it might not be a fright fest like you would find in a movie like The Conjuring or a gore fest like Evil Dead, it's absolutely psychological and finds a few ways to dig right into your skin and stay there. Kubrick's direction is just sublime as he knows how to freak out his audience by doing nothing but staying on Jack's maddening face while the music slowly rises and then suddenly does something simple like flashing up a black card showing which day of the week it is, and it still somehow creeps you out. There's the Room 237 sequence which is pretty infamous and one of the best scenes in the entire movie as the entire sequence came close to sending shivers down my spine, even without offering much of an explanation to what is going on. 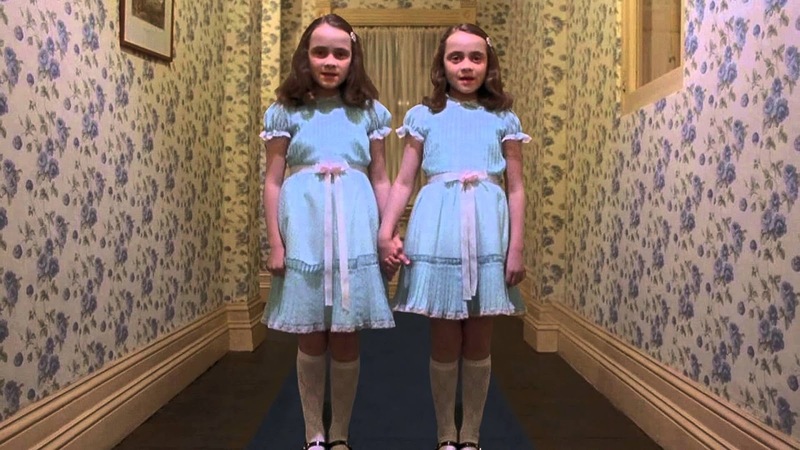 Also twin girls talking in unison is always scary no matter what. With one scene in particular that is especially nightmare inducing. This all builds up to an amazing, nail-biting finale that's so intense you'll feel like your eyes are glued to the screen. Enough of the horror, let's take a look at the acting. Of course we have to start with our lead in Jack Nicholson who is just fantastic here and it's really award winning stuff. Going from your typical family man to something entirely monstrous and otherworldly as the movie rolls on is genuinely frightening. There's also Shelley Duvall who was apparently terrorised during filming to bring out a believable performance. While I don't agree with the way it was done, it really did work as Shelley looks like she's about to have a mental breakdown during some of the more intense scenes. Child actors can be troublesome in these movies but Danny Lloyd did a great job portraying this Danny. He's definitely the emotional core here as whenever he seems like he's in any real danger you're just begging for him to get away. Overall this movie is just a masterpiece of horror and film in general. It's filled to the brim with iconic moments still referenced and parodied to this day. The acting is brilliant all round and the horror is so unnerving that your future dreams will most definitely be affected. It's not for everyone but I absolutely recommend checking it out.